Chams Eddine Mballo was fascinated by flight as a young boy growing up in Dakar, Senegal. He learned at a very early age to fold paper airplanes into different configurations so they could fly as high and far as possible. His aptitude in math and physics caught the eye of his primary school teacher, who wanted Chams to go with him to France to continue in engineering studies. Though Chams remained in Senegal, his teacher’s mentorship continued to fuel his scientific interests. As he grew older, Chams noticed how his country’s remote villages lacked enough medical care facilities and personnel to serve their communities. Helicopters, however, could land without infrastructure and quickly transport patients to the nearest hospitals, or deliver potable water and food to disaster victims. With a mind towards applying his academic skills towards civic good, Chams arrived at the State University of New York at Buffalo to begin his dual undergraduate degrees in Mechanical and Aerospace Engineering. At SUNY Buffalo, Chams developed from scratch a modular snake robot for search and rescue purposes, one of the many accomplishments that garnered him the Chancellors Award for Student Excellence. After graduation, he resumed his passion for aerial vehicles by pursuing his graduate studies in flight mechanics and control at the Georgia Institute of Technology’s Guggenheim School of Aerospace Engineering. Now a doctoral candidate under the advisement of Dr. J.V.R. 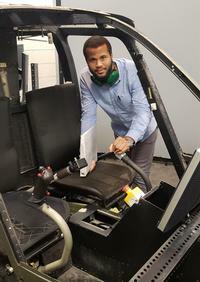 Prasad, Chams is developing real-time algorithms for estimation of dynamic loads in fatigue-critical rotorcraft components, such as blade root pitch link loads, that are not easily measured, as well as control schemes designed to alleviate component fatigue damage. He hopes this new technique will minimize issues associated with the current empirical methods for structural health and usage monitoring, as well as load alleviation control. By reducing maintenance without compromising performance capabilities, Chams believes that this will make helicopters more affordable and accessible. After completing his doctorate degree, Chams hopes to join the industry to put his expertise into real-world application. “Chams can definitely become a great leader in the vertical flight community,” predicted Prasad.